Here are some interesting Singapore Facts which were chosen and researched by kids especially for kids. Capital: Singapore. It's a city state. Singapore was founded as a British colony by Sir Stamford Raffles in 1819. During World War II, Singapore was occupied by the Japanese. It became independent in 1965. Much of the country is built on sand on reclaimed land. The sand is imported mainly from Malaysia, Vietnam and Cambodia. 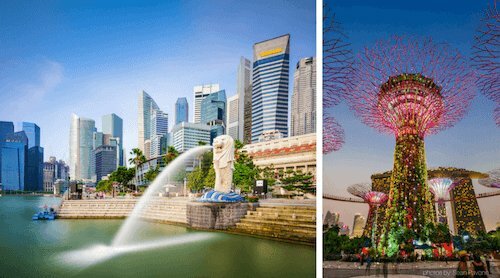 Singapore is an island country on the Asian continent. The country is in South East Asia. A flight from Singapore to Tokyo takes 8 hours, 13 hours to London/England, 12.5hours to New York/USA. On the map below you can spot where Singapore is located in south eastern Asia. 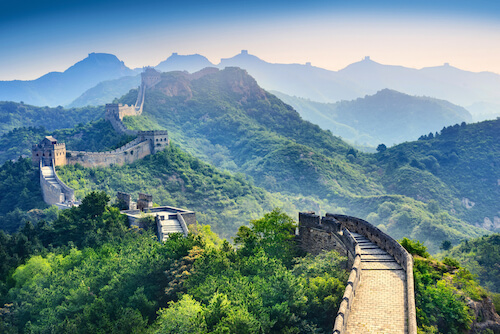 The country lies 137km / 85 miles north of the equator. 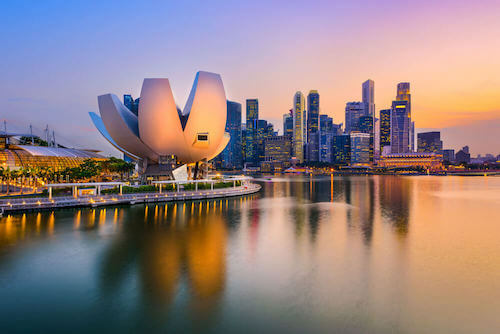 Singapore is a city state which is connected via a bridge and a freeway to the mainland of Malaysia. 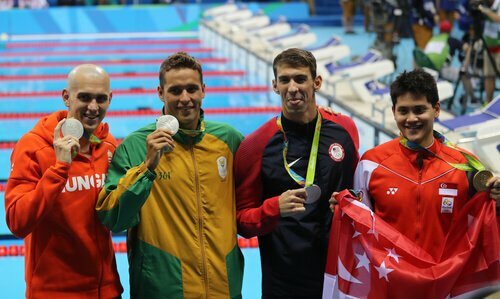 Singapore is not only one island! 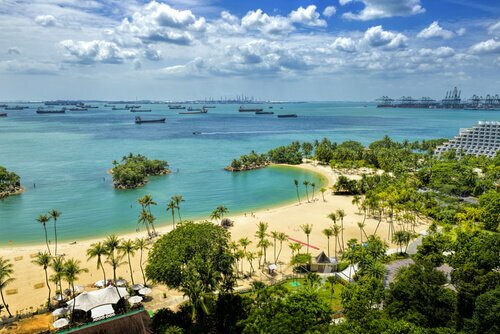 63 islands belong to the city state and are dotted around the Singapore coastline, most of these islands are inhabited. 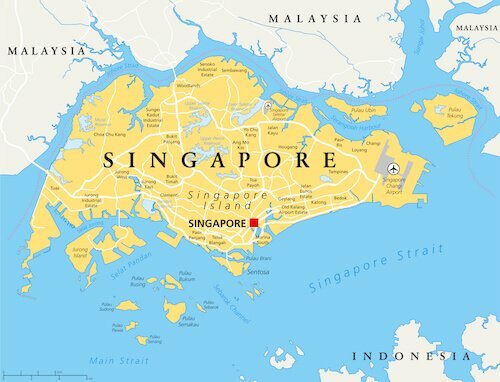 The largest island (after the main island) is Sentosa in the south of the main island. Sentosa Island has many resorts and family entertainment centres such as the Universal Studios, Waterworld. The historic Fort Siloso is also on Sentosa Island. There are several lovely beaches for a fun day out or a relaxing couple of days after the hustle and bustle of the city. The highest natural point of the Singaporean island is Bukit Timah Hill with 164 metres/538 ft.
Singapore comes from the Sanskrit name 'Singapura' which means 'lion city'. 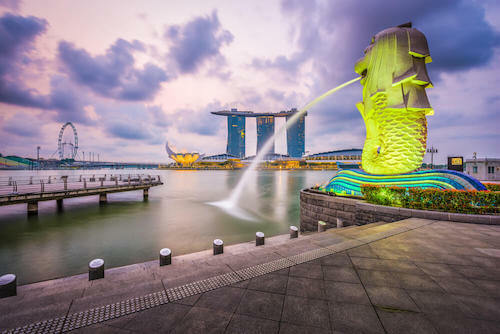 The Merlion, the country's national symbol, has been inspired by the city's name. Actually, the name Singapura was given to the city by a Sumatran prince who ruled in the region in the 14th century. This prince encountered a strange animal when hunting. At that time his advisors believed the prince spotted a lion. However, lions never lived in this region, but tigers! Until the 1930s, tigers could be found in the wild in Singapore, now you only can see one in the city's zoo. Marina Bay with its Gardens on the Bay: fascination modern constructions and a huge nature park including two conservatories: the flower dome and cloud forest. And don't miss the fabulous Artscience Museum (shown below). Jurong Bird Park: Admire the highest man-made waterfall (30metres or 98ft.) 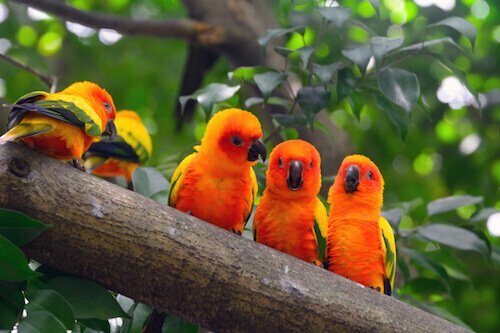 and the numerous colourful birds and parrots in the huge aviary. 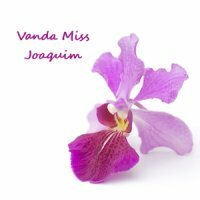 National Orchid Garden at the Botanical Garden: There are over 200 different orchid species, many are named after visitors such as Nelson Mandela, the Queen Elisabeth or even Jackie Chan! Singapore Zoo: Don't miss a 'night safari' or 'breakfast with an orang-utan' in the zoo. The zoo is huge and over 1,000 animals can be seen at nighttime on a train ride through the parklike setting! 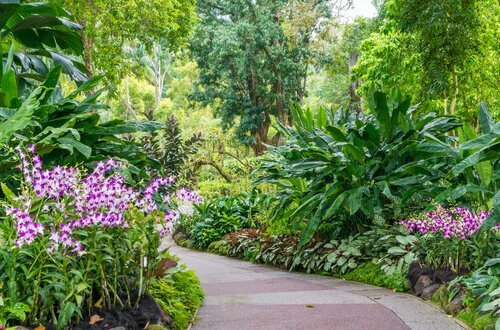 Bukit Timah Reserve: go for walks in this green jungle-like reserve where you can encounter monkeys, see turtles in the lake and admire the many different tree species. Actually in this nature reserve you will find more tree species than on the entire North American continent! Singapore Grand Prix circuit: Singapore is famous for its F1 night races. But the races are so very loud, you have to protect your ears! Visit the Fountain of Wealth at Suntec City. This is the largest fountain in the world! The huge towers around the fountain have been built in the form of a palm of a hand. This form is said to bring good fortune according to the traditions of Feng Shui. The national anthem's lyrics (text) are written in Malay. Almost all Singaporeans are bilingual, that means they speak English and another home language such as Malay or Mandarin or a Chinese dialect such as Hokkien. 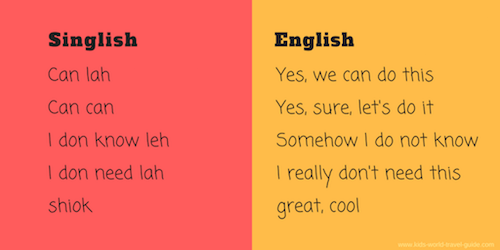 The Singaporeans speak English with a local twist: 'Singlish' adds often a 'lah' or 'leh' at the end of a word. 'Can can' means 'Yes, of course, let's do this'. Meeting friends and eating out at a food centre is a favourite past time for many Singaporeans. 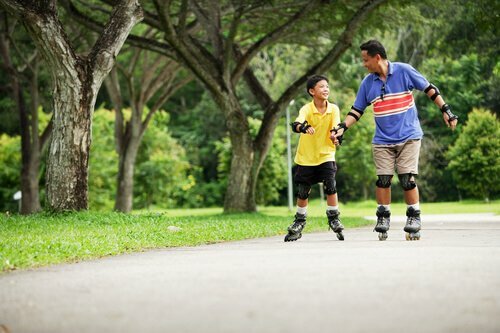 Singapore families like to spend their time together outdoors, skating or walking in East Coast Park or visiting any of the nature reserves of the islands. 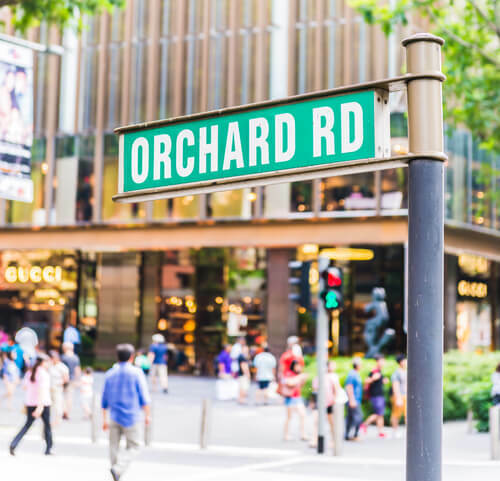 Shopping is also a favourite past time for many Singaporeans, no wonder as Singapore is famous for its huge shopping malls along Orchard Road and the Marina Bay. Teenagers love going to the movies or meeting up for fun karaoke sessions. Singaporean children have to study hard. Primary school usually last until 13h30 and then most kids attend extra lessons either at school or a tutoring centre and some come home only at dinner time. The Singaporeans love fun competitions. They also hold a world record in line dancing! 11,967 dancers participated in 2002 in this massive dance event. Read more about their fun school records here. 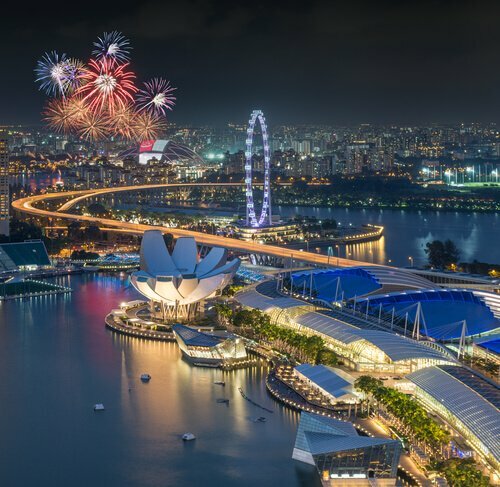 Singapore Facts: The Singaporeans celebrate many festivals. 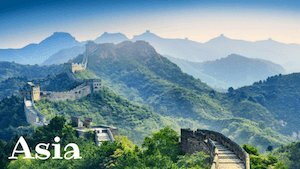 Among the most popular are: Chinese New Year, Mid-autumn or Moon Festival, Christmas. For these celebrations, you will see everywhere thousands and thousands of lanterns and light decorations. Chinese New Year is celebrated in February. Here an image with one of the 2017 decorations in the city. 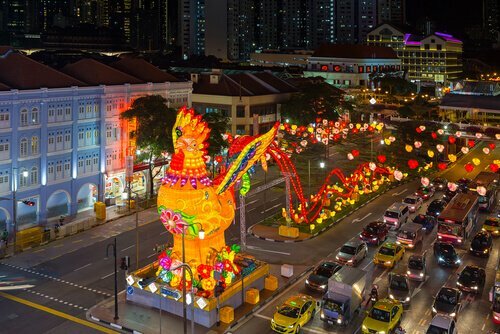 According to the Chinese lunar calendar, 2017 was the 'Year of the Rooster', this is why they decorated the street crossing with this huge rooster! Chinese New Year celebrations for 2018 start on 16 February. 2018 is celebrated as the 'Year of the Dog'. Chewing gum is prohibited in Singapore. You are not allowed to bring chewing gum into the country, otherwise you might get fined at customs. October 1 is National Children's Day. On this day, children receive presents and treats - an a day off school on the Friday of this week! When you are given a present in Singapore, receive it with both hands. Don't open the present straight away, it is polite to wait and to only open it later. Always hand over things, such as money, gifts, credit card or business card with both hands. It is considered impolite if only one hand is used. Singaporeans have good luck numbers: The lucky numbers are 2 and 8. So if you choose gifts, best to hand over two - or eight! And if you give children a money present on Chinese New year, think of these numbers! Singaporeans love to eat rice and rice noodle dishes. 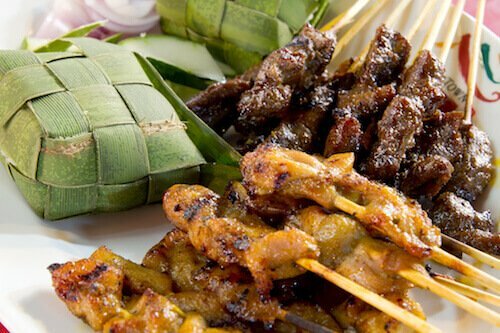 The Singaporean staple diet does not include dairy based dishes, but you will find many dishes including coconut or rice milk products. Singaporeans love to eat out and there are many food courts or food centres all over the city. Here people come to eat breakfast, lunch or dinner or just visit for a snack during the day. 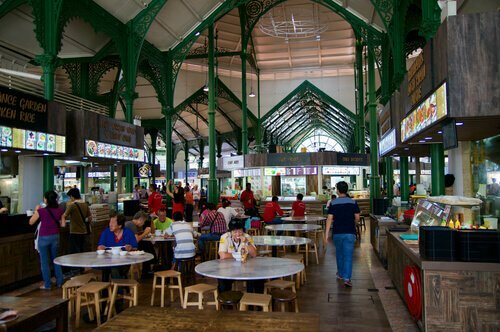 Food courts are called hawker centres and the image below shows one of the most famous hawker centres in Singapore. It is called Lau Pa Sat. Ice Kerang: ice with red bean dessert - delicious! 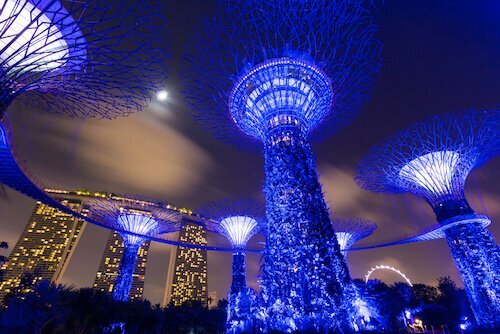 Although Singapore is covered by large urban areas with houses and buildings, but there are more than 24 nature reserves and 5 nature parks in this tiny island nation. Wildlife in Singapore is varied and more than 390 animal species live in the nature reserves. See some animals here. The biggest nature park, Chestnut Park, was opened in 2017 and it is bigger than 110 soccer fields! But this park is still only ¼ of the size of Central Park in New York/USA or ½ of the size of Hyde Park in London. 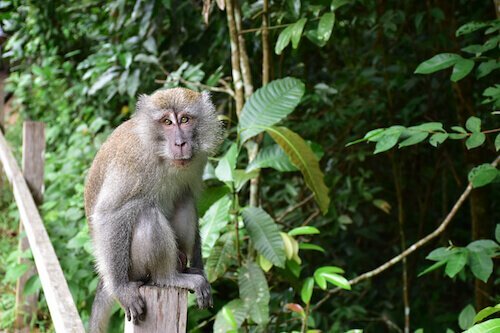 However, there are many hiking and biking trails in the parks in Singapore and along the city's coastline and you can encounter many bird species and of course, monkeys. But there are also some huge flying foxes in Singapore! 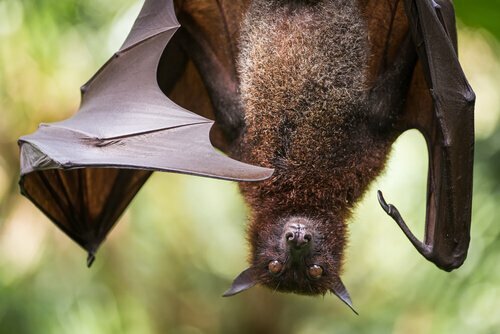 Singapore's flying foxes are the largest bats in the world! They have a wingspan of up to 1.5 metres/49ft. However, these bats cannot be encountered in the busy city but on Pulau Ubin, one of the small islands of the Singapore coast. ... that the lyrics (text) of the Singaporean anthem is printed on the back of the a Singapore Dollar note. The tiny text snippet is printed on the S$1000 note only!